Make your kitchen the heart of your home with Dream Doors Stirling & Perth. Speak to our designers and view our stunning collection at your local kitchen showroom. Speak to our kitchen design team at your local Dream Doors Stirling and Perth kitchen showroom to plan and create a stunning bespoke kitchen for your home. Based in Stirling, you can find kitchen ideas to suit every taste and speak with our local experts who can help you customise your ideal design. 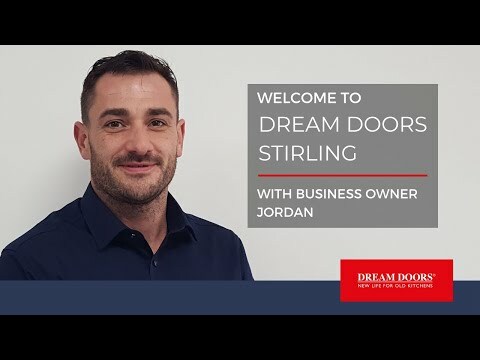 Our Stirling and Perth showroom, owned by Jordan, serves the local FK and PH postcodes and he will be happy to discuss your requirements and help you create your perfect kitchen. Jordan can show you the wide variety of options available to you including our classic, traditional, modern and contemporary designs. As well as our online kitchen design tool, you can also schedule a consultation with Jordan, who can come to view your existing kitchen space and provide a no obligation quote based on your ideas. This is a practical solution should you need some first-hand expertise and ensures our design team can get to grips with your project quickly and efficiently. Dream Doors Stirling & Perth offer kitchen makeovers and replacement kitchen doors and worktops services in all local FK and PH postcode districts in Stirling and Perth. This includes the areas Aberfoyle, Airth, Alloa Auchenbowie, Balquidder, Bannockburn, Blair Drummond, Bonnybridge, Bridge of Allan, Buchlyvie, Castlecary, Dennyloanhead,Dollar, Dunblane, Falkirk, Fintry, Grangemouth, Kilmahog, Kincardine, Kippen, Larbert, Lochearnhead Menstrie, Muckhart, Polmont, Sauchie, Stenhousemuir, Strathyre Thornhill,Aberfeldy, Abernethy, Aberuthven, Acharn, Almondbank, Alyth, Amulree, Auchterarder, Balado, Ballinluig, Bankfoot, Ballintuim, Balquhidder, Birnam, Blackford, Blair Atholl, Blairgowrie, Bridge of Earn, Burrelton, Clunie, ComrieCoupar Angus, Crieff, Dull, Dollar, Dunkeld, Dunning, Errol, Fearnan, Finegand, Forgandenny, Forteviot, Fortingall, Glencarse, Glenfarg, Glenshee, Grandtully, Guildtown, Inchture, Kenmore, Killiecrankie, Killin, Kingoodie, Kinloch Rannoch, Kinross, Kinrossie, Kirkmichael, Lawers, Lochearnhead, Logierait, Luncarty, Meigle, Methven, Milnathort, Muthill, Perth, Pitlochry, Rattray, Scone, Scotlandwell, Spittal of Glenshee, Stanley, St Fillans, St Madoes, Weem,in the FK ans PH postcode areas in Scotland.